Finally completed on Saturday evening, Feb. 17. I suppose the year in review actually starts this week last year, after I had already mailed last year’s cards and update. 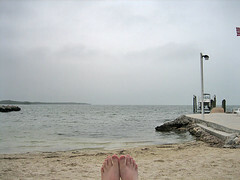 I thought I’d spend go spend a few days in Key Largo. The weather was not real cooperative. It’s actually been warmer here this week up here than it was that week down there (when it was really cold here). I saw lots of cool birds there and got bitten by this bug called kayaking. Click on the photo to go see my pictures from the trip. I thought then that I’d probably own a kayak by now, getting one during the summer after the London trip, but some other things got in the way (as you’ll read below, but maybe not until a later update). So my lone other kayak adventure this year ended up being in February in Vero Beach with Andy. He got his this year. I still want one like the orange boat in the photos. Much of the excitement of the first part of the year revolved around deciding to go and then planning the trip. The opportunity (or motivation) presented itself when I heard about this conference in London during June. I decided to go to the dean and ask, “If I happen to be in London on vacation at the time of this conference, will you pay my registration so I can attend?” She said, “yes.” Then came convincing Mom to go and got convinced when a visiting Aunt Linda told her that this was an opportunity she better not pass up. We invaded Britain via 747 on the anniversary of D-day. After a couple of days of getting acclimated and our first family meet-up when Jean Peach (she’s in the Bence family) came from Newbury to London to see us, we hopped on a train at King’s Cross station that Friday for a weekend in Scotland. London to Inverness by train makes for a very long, but very scenic, travel day. During that morning on the train, we passed through Durham and Newcastle, which is where the Jeckells came from. We spent the weekend in and around Inverness with some cousins of mine from the Galleymore line (my Dad’s side of the family). Actually, Jean Taylor is the first living relative over there that I tracked down, about seven years ago, when I was more actively researching family history. They put up Mom in the spare bedroom at Jean’s and me at Jenni and Alan’s. On Saturday, we piled into Alan’s Vauxhall for a drive around Loch Ness. Highlights of the drive included Urquhart Castle, Fort Augustus, and the Caledonian Canal. We had a fine dinner at the Snow Goose pub in Inverness. Sunday’s drive headed west toward the Isle of Skye. Parts of this drive reminded me of driving from Eugene to the coast in Oregon three years ago. 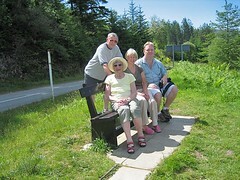 We stopped in Plockton and other scenic places around Loch Carron and eventually found ourselves in Broadford on Skye. We took a different route back to Inverness, along Loch Alsh, and found ourselves at the Eilean Donan Castle along the way, where Mom met Ross the bagpiper. We enjoyed the Snow Goose so much the night before, we went back there again for Sunday’s dinner. I need to note that during mid-June in Inverness, it gets light around 4 a.m. and sunset is around 10 p.m.
Monday morning we boarded a southbound train not knowing where we would spend the next night, which Mom found disconcerting. It was also a rainy day. We headed toward (and through) Wolverhampton (changing trains in Edinburgh and Manchester) to meet up with some other Galleymores, but that didn’t happen and we ended up spending the night in Oxford, where we relaxed and did laundry the next day. Wednesday morning we took the train to Newbury where I dropped Mom off with the Peaches while I went off to London for a few days of conferencing. I got off the tube in London and was headed for my hotel when I first felt a stabbing pain in one of my achilles tendons. I took no footstep for the rest of the trip (and for some time afterward) that did not involve some measure of pain. The conference was great and I enjoyed seeing some old friends, making some new ones, learning, and scouting that part of London for when I returned with Mom on Sunday. The conference finished Friday evening and Saturday morning I boarded a westbound train to meet back up with Mom, Jean, and Gary. The agenda for the day was another road trip. 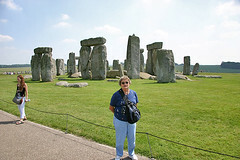 Our first stop on the trip was Stonehenge, which, I have to say, was one of the bigger disappointments of the whole trip. It’s smaller than it looks in documentary films and was overrun by tourists, which is to be expected the weekend before the Summer solstice. Our next stop on the road trip was lunch at The Carpenters Arms pub in Lacock. After lunch, we stayed in Lacock and visited the Fox Talbot museum of photography and Lacock Abbey. The latter served as a set for part of Hogwarts in a couple of Harry Potter movies. Our last stop on the day’s road trip was Avebury–a stone circle larger and older than Stonehenge with a town in the middle of it and surrounded by an earthen berm. It is also permitted to walk among, and even picnic in the shadows of, the stones. That is, if you don’t mind sharing the countryside with grazing sheep. I climbed atop the berm and took the above picture. I sat down for a few minutes and felt more connected to the landscape there than anywhere else in Britain. We headed back to London by train for the last time on Sunday morning. 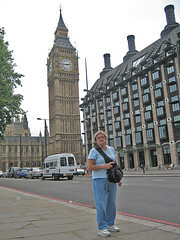 We settled into a different hotel in the Bayswater area this time and set off to Westminster where I showed Mom around the Abbey, the “Great Clock,” Parliament, the Eye, Whitehall, etc. while scouting things for the last few days of our visit. First on Monday’s agenda was a cruise down the Thames from Westminster to Greenwich. After pausing briefly at the Cutty Sark and stopping in the gift shop to buy Mom a windbreaker, we set off up the hill to the observatory. The observatory is really worth the trip, and not just for the geeky photo opportunity. We had a nice lunch at one of the museums and then headed back to Westminster on the boat. 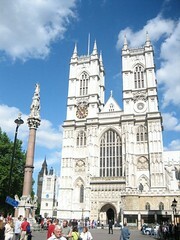 Back in Westminster, we did our gift shopping at the Abbey before heading back to Bayswater for dinner and the evening. 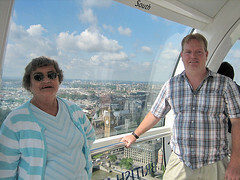 Tuesday’s main event was one of the other “must-dos,” the London Eye. Mom said she could ride that all day. I started out with a slight case of the willies, but that went away as soon as I turned around so I was not facing the machinery. In case you don’t know, it goes really slowly, you go around just once, it takes about 40 minutes to do so, and the view is phenomenal. After the Eye, we took a walk down the south bank of the Thames to the Charing Cross Bridge. We crossed the pedestrian bridge and then caught a subway headed for St. Paul’s Cathedral. We didn’t go in the “paid” part of St. Paul’s, but what we did see was amazing. We had lunch in the basement cafe. After lunch, we walked to the middle of the Milennium Bridge and back before going gift shopping at Harrod’s on the way back to the hotel. Wednesday was our last full day in Britain. The first order of business was a trip to the Hampstead area to look for some addresses related to the Bence family. 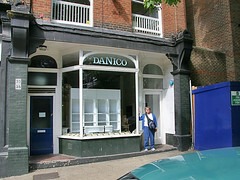 We struck gold in that regard about one block from the Swiss Cottage tube station where the former storefront office of the construction firm of H.R. Bence & Son looked almost unchanged from pictures taken about 60 and 100 years ago. If you get close, you can still see where “H.R. Bence & Son” was chiseled off the facia. From there, we set off on foot to find one of the old Bence homes, which was nearby at 17 Crossfield Road. It was neat to imagine that my ancestors had once walked down the same sidewalks. The final touristy thing on the agenda was a trip across town to the British Museum. The main attractions there were seeing the Rosetta Stone, the Elgin marbles (Greek relics from the Parthenon), and Greek statues. You could easily spend a week in that museum. We capped off the trip by meeting and having dinner with my cousin Deon (of the South African branch of the Galleymore family). I really wish, for a number of reasons, that we would have met up with him earlier in the trip. Check out all the photos from the trip in the Flickr album. Mario turned 16 in September. 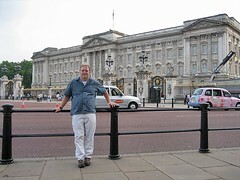 My biggest fear about going on the trip to England was that he would die while I was away. The vet says he is very healthy and energetic for his age. That seems to have taken a downturn just this month though. He’s had a heart murmur for as long as I’ve had him. He has mild case of congestive heart failure. He’s also been having trouble lately with something called “geriatric vestibular syndrome,” which is best described as being like vertigo in humans. The first time I saw him through a spell of it, I thought he had a stroke or something. Now if I notice the problem, I just have to modify how he enters and leaves the house to visit the yard. I won’t be surprised at all if I write next year about his passing, but I know I’ve thought that the last two years too. Update: Mario was put to rest on 12 Jan 2007. My nephew Randy got married in August. Later in August, I go to Chicago to work the SPJ convention. I went to the UF-UCF football game. It was my first UCF football game even though I went to school there. I quit biting my nails. I worked a lot because of management changes there. I hit the ground running when I got home from England and don’t think I really paused until Christmas.